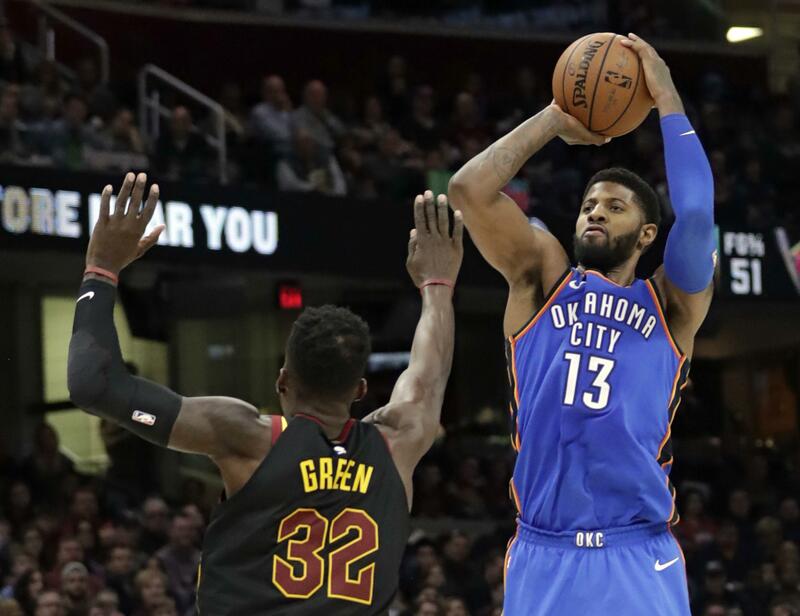 UPDATED: Sat., Jan. 20, 2018, 10:36 p.m.
CLEVELAND – LeBron James couldn’t get to 30,000 career points and he and his Cleveland teammates couldn’t stop Paul George, Russell Westbrook or Carmelo Anthony as the Oklahoma City Thunder thumped the Cavaliers 148-124 on Saturday for their fourth straight win. HOUSTON – Chris Paul scored 33 points and 11 rebounds, James Harden had 22 points and Houston held off Golden State to snap its 14-game road winning streak. PHILADELPHIA – Joel Embiid had 29 points and nine rebounds and Philadelphia pulled away from undermanned Milwaukee for its seventh win in eight games. MINNEAPOLIS – Andrew Wiggins scored 29 points and Karl-Anthony Towns had all 22 of his points in the second half as Minnesota rallied from an 11-point first-half deficit to beat Toronto. SALT LAKE CITY – Donovan Mitchell scored 23 points and Utah closed out Los Angeles. NEW ORLEANS – Jrue Holiday scored 13 of his 27 points in the fourth quarter, DeMarcus Cousins had 24 points and 10 rebounds, and New Orleans beat Memphis. ATLANTA – Robin Lopez scored 20 points, Lauri Markkanen added 19 and Chicago easily beat Atlanta. PORTLAND, Ore. – Damian Lillard hit his first nine shots – including seven 3-pointers – en route to 31 points, and Portland beat Dallas. CHARLOTTE, N.C. – Kelly Olynyk scored 14 of his 16 points in the fourth quarter, including a free throw with 0.2 seconds left, to help Miami erase a five-point deficit in the final 34 seconds and stun Charlotte. Published: Jan. 20, 2018, 10:10 p.m. Updated: Jan. 20, 2018, 10:36 p.m.